As you have learned in this blog, IT people are an easy prey to self sabotaging ideas and generally eating unhealthily. As you can read in this blog post where Mike turned around the focus of his blog (from food reviewer to healthy food advocate) the truth of the matter is that we can't sustain the hundreds of extra calories eating out gives you. You either exercise like an athlete or you have to come to grips with reality. I especially appreciate how hard it is to do a log of everything you eat in a day, like he started doing for vDM30in30. His blog posts are really detailed and they show his thought process and how he counted everything that day. It's imperative for anyone doing real weight loss to track what they eat. I use MyFitnessPal, and I've had some really long streaks - the longest was half a year. But invariably, I miss a few days and I have to start over again. It's difficult - and it's most difficult when you go out, because there isn't a nutritional label to scan in most restaurants (although several chains are in the app, which is the biggest plus it has). If you are in the same boat as Mike and I, reach out on twitter and help keep us motivated. I know first hand how easy it is to get off the ideal path for days or even weeks. I see it in my blood sugars and my weight scale - every so often we need to remember that this marathon is still ahead of us and all we're run so far doesn't count for today. We have to earn a healthy status with a healthy lifestyle, every day, and make it a habit - a habit to not soften, dull, or self delude ourselves! 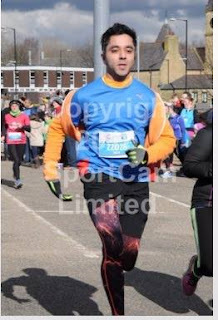 OK so lets talk about....RUNNING! Now let me be very very VERY clear........I have always hated running. Just the idea of it had me like blehhhhhhhhhh. The first time I did 5k....it took me nearly 50 minutes! I am not really unfit but I have just hated it always...with a passion! But over the last 10-12 months, I have really started to get into it, for various reasons. My GF decided she wanted to start running, and I am a firm believer in supporting anyone who is actively making strides to become better in whatever they do. It is too easy to sit around and whine, loads of people do that, but I respect and admire people who actively get up and do something...anything..just start. I make it hard for myself to back out and I have to keep going. Because I was sooo crap at it, every-time I did it...I got better at it, and this made me want to do it again! I have found that it is an incredible mental challenge, every bit of my mind wants me to stop...but pushing past that feels amazing. For me the overall time isn't as important as the distance! A virtual run is one where you sign up on-line for a specified distance, and then run at your own pace. Some of these runs are on based on an honour system, where they do not ask for any proof, so it is up to you to be honest with y ourself, while others ask for you to post your step count (from your fitness tracker), or screen shot your runkeeper app, or a picture of your treadmill time etc. You are responsible for submitting your time\distance. They arent bothered if you run the whole distance, or if you split it up into multiple smaller runs, no one cares about your time. The key is you get better, and you get some seriously cool bling! Some of the money goes to charity too. To me that is multiple wins right there! I mean I am a nerd and you can get cool medals, I ran a 10k and got a Romulan Warbird medal! I ran another 10k and got a Martin Luther King medal!. You can find races that you think are for a good cause and now you have something to aim for and work towards. I ran my first outdoor tarmac 10k for charity and ran a time of 1:04 and I got a cool medal for that too! My goal at the moment is to have more bling than Mr T! hahah and lets just say I am off to a good start! I have also signed up on my first Obstacle Mud Run course thing....and I hate mud and I hate cold water...so this will be interesting! Greek yogurt is a food that has a lot of protein and can also have zero amounts of fats and low carbohydrates - more so than regular yogurt. In some cases you can also get a decent amount of fiber. The trick is to find greek yogurts that have very few carbs, very low fat but still taste good so that they can be used as part of a healthy diet. I'm going to review three yogurts and go over their nutritional information. 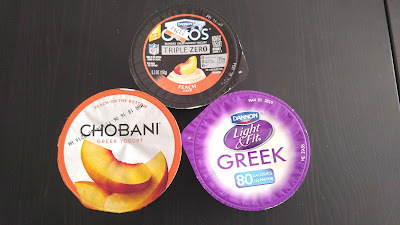 Chobani "Fruit on the Bottom"
I've made this table comparing these three yogurts, which are all the same flavor/style (small pieces of peach sweeten the base yogurt) and are all easily found in supermarkets and warehouse stores. Please note that depending on the flavor of the yogurth these values may change. I see this specially in Chobani or when choosing a flavor such as vanilla. 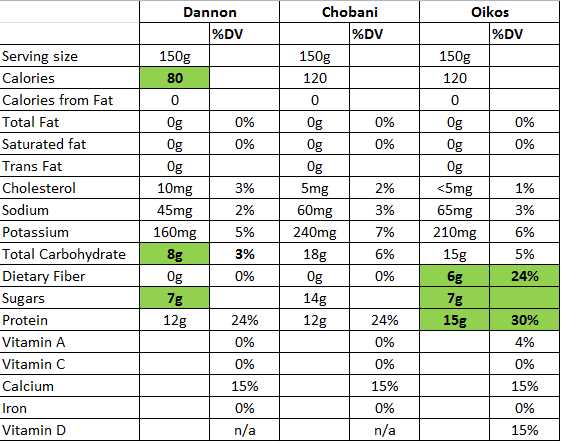 Analyzing, we see Chobani is the one with the most carbohydrates/sugar and thus is only suitable for diabetics when that energy will be used. Examples would be for an early morning snack or an hour before your workout. The good news is that Chobani uses normal sugar sources - the other two yogurts use "fake" sweeteners. It does not have fiber. 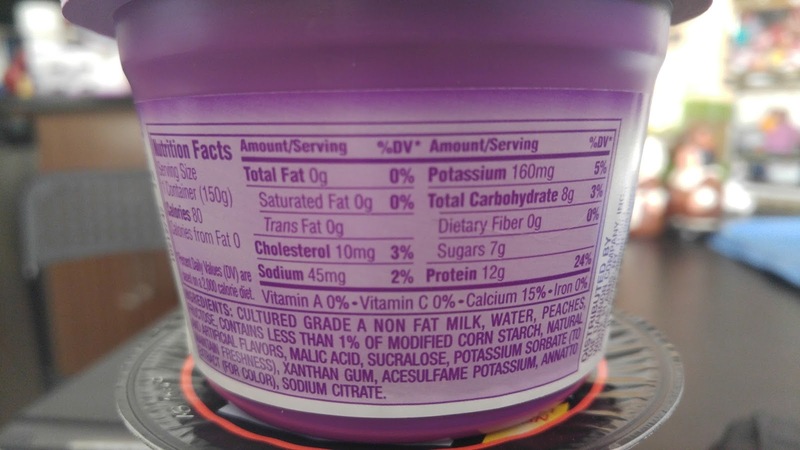 Dannon Greek light and fit has the least carbohydrates and a decent amount of protein but it does not have fiber. I find this is an excellent yogurt for dessert or a night craving. Perhaps thanks to using the most processed ingredients, it's also the one that tastes the best in my opinion (i'm being honest...). This is the best option if you are trying to lower your A1C. 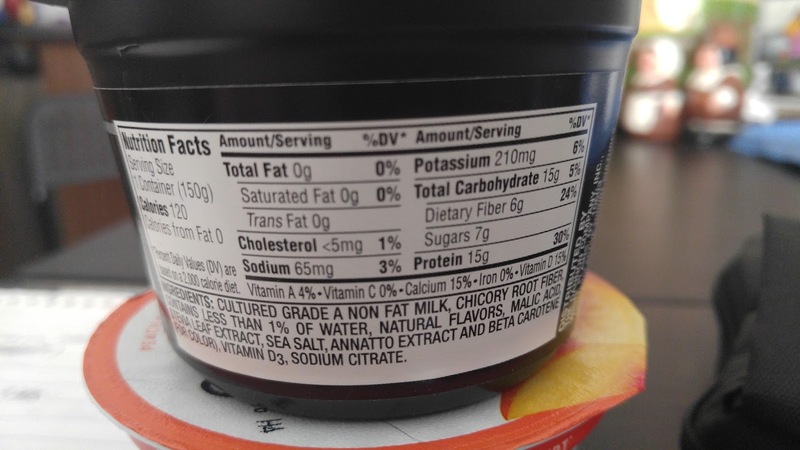 Oikos triple zero has a medium amount of carbohydrates (note that the sugar amount specifically is the same as Dannon though) but it has the most protein and is the only one with the added benefit of having chicory root - which means it gives us fiber. Even though it's in the sweeter side, I find this a better option to Chobani because fiber goals can be difficult to attain. It's sweetened with Stevia as we can see in the ingredients list which is regarded to be more natural than sucralose. The ones I will continue to buy are Oikos and Dannon. Dannon is my "craving" yogurt for when I'm hundry or want a nighttime dessert, and Oikos is my workout or early morning yogurt. Since protein is difficult to obtain I do plan on eating at least one daily, and if I work out I'm eating one of each. Dannon has the added benefit that it's available in case presentation in Costco (strawberry, blueberry, peach, all having the same nutritional values). I have not found Oikos yet in a warehouse store but I wouldn't be surprised to find it in Sam's for example. 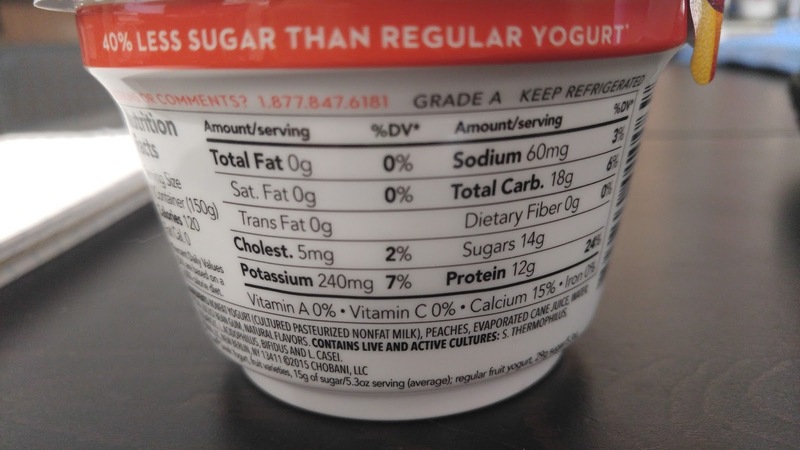 Chobani is found in Costco as well but as you saw it's not the best option if you are diabetic and won't be doing exercise after eating it, and it doesn't win in the taste test either in my opinion (it's perfectly ok but not as good as Dannon). I'll add one positive note for Chobani though - for savory cooking, I find their non fat plain yogurt to be the best tasting (the blue one). My wife makes a killer chipotle dip with it! So all us guys/girls that work in IT are for the most part big fans of gaming! Be it console gaming or PC gaming and we pretty much all have fond memories of the Sega Gensis/Megadrive/NES/SNES etc. This blog post came about after listening to The Art of Manliness Podcast @artofmanliness (which I have to say I have been a big fan of for over a year) and their podcast with the guy that runs Nerd Fitness @NerdFitness. I have been a big fan of Nerd Fitness for ages, esp the Nerd Fitness blog posts. They covered many topics that I have mentioned previously, but from a gamers point of view, and I thought this is a way soooooooooo many of us could relate to. For example in a game, you will start off with very little skill, and you have to do various mundane tasks that you may think don’t have any real benefit, you level up so you can beat the end of level boss, after which you go on and do some more to fight the next boss. If you decided to jump right in and go for the end of game boss (your ultimate goal) you would fail, simply because you hadn’t earnt all the stuff you needed and obtained the skills you needed to get there! Also if you get to a boss and you fail, you will restart and try a different approach. But it is amazing how in real life, so many of us don’t do this, we fail at the boss fight and then give up, but in the game we try again, even if it means loading a save from a bit further back so we can try something different. Why is it we are happy to do that in a game but not in real life?! The podcast is brilliant and I have also pre-ordered the new Nerd Fitness book which is out in March. So if you want to start running, you can start by walking. If you want to eat healthy, start by eating some fruit, small changes lead to big things if you keep going and build them up. I have gone from not being able to run at all and hating it, to doing 5k and now I have managed to run 10k, it has taken time and I have had to level up....my original boss/goal was to start running, next level was to get a decent 5k time and the level after was to get to 10k...and so on. I rewarded myself along the way, when I reached 10k I bought myself some nice running gear, something that I can reward myself with, but will help me reach my next goal/boss fight, which is getting a decent 10k time! When I started with Fitbit I thought about joining an existing a group or starting one, but didn't know any people that fit both circles. It wasn't until VMworld 2015 that I seriously made a point of identifying people with fitbits and adding them as friends. Through this I was even able to meet and discuss the idea with Jim Jones that ultimately became this blog. I checked and #vFitbit wasn't taken, so i've been using it since. Thanks so much for Jim Jones and Matt Crape that supported this crazy idea! But also, to my vFitbit friends who either haven't seen this or didn't feel comfortable with being publicly called out (which is perfectly fine and understandable!). Each week of competition is a big motivation for me, and it means a lot! - Establish a daily goal of 10 floors. I've always liked climbing floors, and my building has 5 floors, so I can accomplish that goal easily. - Track my food intake. This was huge. This was the first time I was able to track my daily intake of carbs, protein, etc. I since have replaced this with MyFitnessPal which I detailed here but the Fitbit app is a great way to start, even featuring its own "scan the barcode" database. - Easy sync, including removing and adding a new device. - Easy integration with other software. I've been able to integrate my fitbit account with my care provider's app, with my employer's health benefits account, and with MyFitnessPal, and I'm not even trying too hard. It's great to see your results updated automatically everywhere. - One of the things that motivated me to write this blog was how I saw my friends and co-workers try to shape up when they saw the change in me. Those that bought a fitbit (I even gifted some) were able to add me as a friend and they also got the bug. It's a HUGE motivation to be able to do this with a friend! - The achievement badges are a lot of fun. They're witty and easily shareable on social media. - The competitions are only 4 types but they are good. I always run weekly and weekend competitions, and sometimes use a daily one if I want some extra motivation. - Once you run into another person that has a fitbit, there's a good chance they will agree to do challenges together. Anybody that has one of these is trying to be better about their health, which is great! I run separate challenges with separate circles and it's a lot of fun! - The app does a great job of telling you when you are doing good or someone is sneaking up or if anyone has hit their step goal or taken the lead. It keeps you in it enough that it's a game! - both the small and large have fit me perfectly ok, which is great since I bought a large for my dad and it was too big for him. we were able to swap them and he was happy. - firmware updates have added cool things. You can flick your wrist and it will light up. You can also just tap it with your finger to cycle through the screens. - Sometimes, especially when walking a lot outside and wearing a jacket, it can count a lot of floors. I was walking the national mall area in Washington DC and it counted 100 floors. I walked a lot but I'm pretty sure I would have noticed! Supposedly it measures atmospheric pressure and this could explain a bit. Otherwise, it's a pretty good sensor. - Battery life is at best 3 days tops. Maybe having it sync automatically and having bluetooth on all the time affects it. - They only sell the XL over their fitbit.com store. At some point it was sold out and it was a pita to get an ETA when they would bring it back. When they finally brought it back, they didn't send me an email alert (which I had signed up for). They weren't helpful through twitter or email either - so don't expect much from their support. - Seems a lot of people, when reporting problems, get sent a new one and are told to dispose of the older one. What the? I mean, it's great if the problem is indeed the device, but how much feedback to improve their products are they missing out because of this? Plus it must eat into their revenue (although I bet their markup on the devices is insane). - Getting the heart rate reading on the app, when you sync, takes a good 10 seconds more than the rest of the stats. I don't understand why. The tracker shows the bpm immediately. - The fitbit food tracker database is not very good. That's forgivable since it's not their main focus. What isn't forgiveable is that the things you submit never get reviewed. I submitted a bunch of things and they were never added, nor did I get any feedback. Why even offer it if no one checks it? Solution was to use another app and tie it back to fitbit. - 5 challenges at the same time is too little. I think this artificial limit should be lifted. - It is not intuitive how to add friends, especially if you are already invited to a challenge with them. The first option you are offered is to add them by email. The actual best way is to click on the challenge options and then you get a list of every person, where you can just click on the person and send them a friend request through there. - Love that they added the feature to just flick the wrist and have the tracker wake up, but it's not 100% reliable. - Can't check the battery level on the charge HR itself. It will faslh a low battery when it's about 10%. - Lots of extra reporting features are available as a premium subscription. I did the trial and wasn't impressed enough for it to be valuable. Let me know any others and i'll add them! 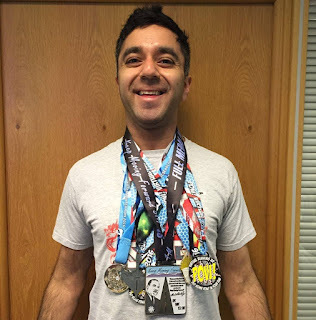 My friend Bilal did an excellent post on fitness trackers on this same blog here. After getting diagnosed with diabetes, and reading a bit and realizing exercise is such a big part of the treatment (which really is a lifestyle change) I decided to check them out and see if they could help me. My phone, like other phones, already included a pedometer. My initial thought is that this worked pretty good since I didn't do much meaningful walking without the phone - so I wanted to figure out what did the dedicated fitness trackers do. I also did not want to spend too much on something that could perfectly well get crushed or become inoperable because I forgot to take it off when going into the shower. Now, talking fashion - I'm not a trendy guy. I also live in a place where I''m walking a lot of the time, and I did not want something that could bring attention to me. So, the objective became to find something with a lot of sensors that would appeal to my needs, wasn't too expensive, and wouldn't bring too much attention to me. Easy to operate would be nice as well, and had to sync with my phone. 9 Water resistant - don't swim with it but a slight splash won't ruin it. 11 Three available size bands. Glad since my wrists are really small. The Fitbit arrived soon (after (I bought it when they cost $150) and within days I realized this was awesome and one of the best decisions I've made in my life. Having the device all the time was working better than the phone, since you don't go to the gym with the phone in your pocket, you put it in a hole somewhere. Also, the app also includes a weight tracker, calorie/food tracker, and water tracker, which I immediately started using. Here I noticed an important thing - my engineer mindset suddenly had a lot of data that it did not have before. Remember I had decided to take my condition as a problem I could do something intelligent about? Here was something I could immediately use to build and perfect my strategy. With this and my sugar measurements I could get to work. My following post will get a bit deeper into how I've used this information to help me lead my lifestyle change. If you have a fitbit and wish to add me as a friend please don't hesitate to contact me through twitter!